The Constitutional Convention has agreed that changes to Dáil elections might also include an entirely new electoral system. Ireland has used PR-STV to pick its TDs for over 90 years - but could be about to dump the system in favour of one of a number of alternatives. FOR OVER 90 YEARS Ireland has elected its TDs through its tried and trusted system of proportional representation – with multi-seat constituencies filled by giving each voter a single, transferable vote. That could be about to change, however, with the Constitutional Convention asked to look into possible reforms of Ireland’s ‘PR-STV’ system. At the first of two meetings on the topic last week, the convention agreed that electoral reform should not necessarily be limited to tinkering with the PR-STV system, but could include a more fundamental change in how TDs are elected. They’ll meet again next month to look at some options in greater depth – but in advance of that, here’s a guide to the way each system would work, and a quick analysis of the pros and cons of each. The PR-STV system has become a reliable – and almost beloved – trait of post-independence politics in Ireland, with the system used for elections at all levels throughout Irish democracy, from local councils right up to the Presidency. Proponents of the current scheme argue that its results are broadly representative of the true motives of the electorate – a five-seat constituency may regularly return TDs from three or four parties, offering true variety for its electorate. This argument gets a little thinner when the constituencies become smaller, however. A five-seat constituency allows for some variety but a three-seat constituency doesn’t give the same room for manoeuvre – and may regularly return one TD from each of three strong parties, or two from one and one for another. It can therefore be almost impossible for a smaller party to gain a significant foothold in a constituency that elects a smaller number of TDs. Among the possible tweaks that could be considered is therefore the idea of making current constituencies larger, allowing more than the current limit of five TDs per constituency (though the limit of five is set by the Oireachtas itself; the constitution allows up to seven). This could mean larger constituencies, electing seven or eight TDs – enough to be broadly reflective of a multi-party system, and ensuring that members are not seen to be attached to a particularly small part of the country. The alternative is to keep the PR-STV system but to make constituencies smaller - leaning towards single-seat constituencies like those in Westminster. This makes it nearly impossible for small parties to win, however – particularly if the PR-STV system is retained and allows voters to transfer preferences between larger parties. At the ballot last weekend, 41 per cent of voters said electoral reform should only involve tweaks to PR-STV – so this may end up being the fruit of the convention’s endeavours. However, 59 per cent said reform might be broader – opening up a whole palette of alternative options. Northern Ireland offers a fairly unique picture of how this could work – as its Assembly constituencies each elect six MLAs, while its MPs in Westminster are from single-seat constituencies. The Assembly is elected by PR-STV, just like the Dáil – and the difference between the profile of the Assembly and the Northern Irish MPs elected to London is a good illustration of the impact each system can have. The 108 members in the current assembly include members from seven parties, plus an independent, while there are only four parties (and an independent) represented among the 18 MPs in Westminster. The Westminster-style option – where each constituency is represented by one TD alone – is an option that could be adopted here (though one that was supported by only 3 per cent of the convention members last weekend). That could mean that the whip system currently used in the Dáil would be a bit weaker – as kicking a TD out of party would mean that the party’s headquarters risk isolating the local branch. Whip systems in the US House and Australia, where similar systems are in place, are similarly weak. As illustrated, though, it would mean there might only be a couple of parties represented in the Dáil at all – going on Ireland’s 2011 election, for example, Fine Gael and Labour would have topped the poll (and therefore been elected) in pretty much every constituency. Fine Gael would therefore be in government alone, with Labour and a mere handful of Fianna Fáil and Independent TDs in opposition. A sign outside a polling station in Italy shows the ‘party lists’ of candidates in the 2004 European elections. One system used in many continental European countries, particularly Italy, is the ‘party list’ system – where people don’t vote for individual candidates at all, but rather vote for the party to which a candidate belongs. 29 per cent of the convention members said they would like to examine a “proportional list system” – keeping the single transferable vote but instead asking voters simply to rank parties in order of preference. It is then the political party, and not the candidate, which holds a seat – with the party itself choosing who will take its seats in the parliament. The ‘closed list‘ system, where political parties decide in advance who their prospective TDs will be. This means that a party will publish its list of prospective TDs, ranked in order. The ‘open list‘ system where voters get to influence the ranking of TDs within their party. This would likely mean similar elections to those which currently take place, where people vote for candidates instead of parties – but the cumulative votes of the candidates will be used to decide the party’s number of seats, while the performance of candidates against each other will determine each TD’s ‘ranking’ on their party list. The ‘free list‘ system, a type of open list where voters not only choose which party to vote for, but also get to vote for candidates within the party on a separate ballot paper. 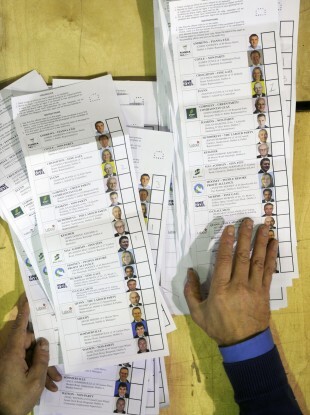 A voter will be given one ballot paper asking them to choose their preferred party, and another ballot paper for each of the parties – casting similar votes to those already used in Ireland to determine where candidates appear on the party list. For example: A voter may decide (for whatever reason) that they want to vote for Labour, but don’t want Eamon Gilmore to be one of its TDs. They can then put Labour as their first preference party, but within the Labour list, vote for every candidate except Gilmore to push him down the list. The chances are that none of these systems would be rolled out on a national basis, where the entire country is treated as one constituency. Instead, there may be larger constituencies – similar, perhaps, to the ones used for European Parliament elections. This would ensure that smaller parties with support concentrated in fixed areas would be able to gain some representation, by needing a smaller number of votes to take a seat. The largest problem with these systems is that they tend to be very complicated and take a long time – not only to count the votes, but also to cast them. Imagine how long it may take you to vote if you have to choose not only your favourite parties, but your favourite TDs within each party. This is the exact opposite to the PR-STV system we enjoy now, where voting is almost as simple as possible – where you simply rank the candidates in order of preference, using their party as merely one basis for your decision. On the upside, however, it might mean that people are asked to think less about the candidate they might elect (whose status could be determined by, say, their record of community work) and more about the party and its policies. Because TDs in the Dáil would therefore not officially represent their home areas, they could feel free to concentrate on national issues and leave local matters in the hands of the new county council structure. 4. The best of both worlds? The option preferred by the convention last weekend – with 69 per cent of members expressing an interest in it – was the ‘mixed’ system, which is basically a combination of the party list model and the direct constituency model we already have. This typically involves setting aside a certain number of seats which are elected through the party list system, while the remainder are elected in the more traditional model of direct voting for a candidate. For example, in a Dáil of 150 seats, 100 TDs might be elected in the traditional way while 50 more seats are filled by parties based on the support they get in a separate parallel election. Again, there are a couple of varieties. The method mentioned above is the same as the one in Germany‘s Bundestag, where half of the seats are filled on a Westminster-style ‘first past the post’ system and half are filled through party list elections, administered separately within each of the 16 federal states. In New Zealand, the system is tweaked a bit – and there isn’t actually an election held to fill the party seats. Instead, these are automatically awarded to parties so that their numbers in parliament reflect their share of the national vote. There, 70 out of the parliament’s 120 seats are elected in a more traditional way, while the other 51 are set aside. So if a party happens to win 20 per cent of the vote nationally but ends up only taking 10 seats (when its share of the vote perhaps should mean it got 14), it gets compensated by taking extra seats of the other 50. Which model do you think might work best for Ireland? Let us know in the comments. Email “Could Ireland change how it elects its TDs? Here are the options”. Feedback on “Could Ireland change how it elects its TDs? Here are the options”.